Backup and Standby Electrical Generators - Equipment designed to provide emergency electrical power to buildings and equipment in the event of temporary loss of primary power. Emergency Backup Fire Pumps - Equipment designed to provide temporary water pressure to fire protection systems in the event of loss of electrical power primary system pumps. Emergency Backup systems by are definition designed to operate during the failure of primary systems. Equipment chosen for this purpose must have the capability of quickly starting and then operating at or near full capacity for extended periods of time. Because this equipment sits idle for extended periods of time it often requires extra components and specialized maintenance to be able to fulfill its emergency functions with 100% reliability. When diesel engines sit for extended periods of time they suffer from forms or deterioration that are not normally seen in engines used on a regular basis. Corrosion both internal and external is much more of an issue. The additive package in antifreeze deteriorates and breaks down to a point where the fluid no longer protects the engine and cooling system. Acids within the cooling system will then destroy radiators, thermostats, water pumps, cylinder liners, etc. Often engines, generators, and pumps that are otherwise very well maintained suffer failures due to the condition of the fuel. An engine that runs on deteriorated fuel can be hard to start, poor running, create excess emissions, and can suffer catastrophic failure when required to operate under full load. Petroleum fuels begin to break down as soon as the refining process is completed. Diesel fuel begins noticeable deterioration in 60 to 90 days and this process continues until fuel becomes unusable. As fuel sits, the aromatics begin to evaporate through the venting system and the heavier asphaltics and asphaltenes fallout of the fuel settling to the bottom of storage tanks to form a thick sludge. As the fuel deteriorates, it darkens and loses its lubricating ability. Diesel is also hygroscopic; it attracts and holds water, which promotes the formation of gums and varnishes in the fuel system. Water also promotes the growth of bacteria in fuels and leaches sulfur from the fuel to form acids that are extremely corrosive to metals, gaskets, and seals within the engine. Heat and moisture accelerate these processes dramatically. When engines are run they return hot fuel to the fuel tank, this increases condensation and production of acids. These acids further accelerate the oxidation and breakdown of the fuel. As fuel ages it ability to properly lubricate the fuel system deteriorates significantly, the Cetane rating drops making the engine harder to start and reducing performance; sludge, gum, and varnish can plug filters and create injector and combustion chamber carbon further reducing performance. A combination of treatment, fuel polishing, and periodic replacement of stored fuels is required to maintain backup systems at full readiness. Fuel polishing is a process using a combination of fuel treatment and the pumping of the fuel through a multistage filtering device to remove solids, sediment, bacterial growth, and separated fuel components. This is generally done on an annual basis; however in some cases twice a year will be needed. With treatment and fuel polishing done a regular basis you will significantly extend the useful life of stored fuels. Eventually however this fuel will need to be at least partially replaced. We suggest that you can treat new fuel when delivered and polish annually for three years. After three years you should either use at least 25% of the stored fuel or have 25% pumped out and replaced with fresh fuel. The next year you can treat and polish, the next replace 25%, and so on. Regular scheduled testing and remediating or replacing fluids such as lubricating oils, coolant, and fuels. Antifreeze should be checked for correct pH at least semi-annually. Depending on results, either a supplement should be added or a portion of the coolant should be replaced. Cooling systems should be flushed and the coolant remediated or replaced on a scheduled basis. Lubricating Oil should be sampled and tested annually for metals, acids, and coolant. Lubricating Oil should be remediated or replaced based on test results and manufacturers recommendations. Fuels should be tested annually and treated to stabilize accordingly. Fuel should be remediated or replace as necessary to maintain a clean high quality fuel supply. It is vital to be sure that the entire fuel system of tanks, day tanks, and engine filtering is adequately maintained. Regular scheduled running of the equipment where the engine is brought up to full operating temperature and run under a full load for a specified period of time. Engines need to run regularly to maintain readiness. Simply starting and engine and letting it idle is not sufficient to maintain the engine or to demonstrate readiness to operate in an emergency. Full load operation provides many necessary benefits to this equipment. First it demonstrates that the power transfer equipment operates correctly. Next, generators need full load operation to be sure they work properly. Generators that are not run under a full load for a stated time period (usually one hour or longer at least once per month) suffer deterioration in the magnets and brushes used to generate the electricity. 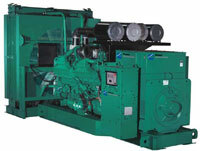 It is not unusual for a generator not run under a full load regularly to lose up to 50% of its generating capacity. With the engines, while they can appear to run fine at idle or under no-load conditions, they can have many problems under full load. A simple partially plugged fuel filter will allow an engine to idle or run up to speed at no-load, however as soon as a load is placed on this engine it can bog down, stall, or even fail. Engines need to operate under full load for one to two hours to completely and evenly heat all the components. This heating flexes and seats gaskets and seals, allows water and acids to evaporate from motor oil, cleans and purges fuel injectors and pumps, allows coolant to thoroughly mix and circulate to protect engine components. In many cases a "Catch 22" situation arises where because of poor operation, engines are not enough to allow problems to be found and corrected. If you investigate almost any type industrial equipment failure, you will find not a single catastrophic failure that happened by itself, but rather a series of small problems and failures that lead up to the major catastrophic failure. If the fuel and engines are properly maintained, there will be far fewer complaints when the equipment is run on a scheduled basis. As the equipment is regularly run, it will improve in performance further reducing complaints. While it can be politically difficult to get everyone on board with the need to perform these reasonable required maintenance functions, it is vital to the safety of students, staff, employees, and the surrounding communities that this emergency equipment functions as designed in the event of an emergency. It is important to consider that the people who complain the most about scheduled testing are the same ones who will scream the loudest if there is a failure during a primary power failure. It may be necessary to schedule some of these load tests during nights and or weekends to facilitate the switch to generated power without major disruptions. In an area that can have severe winter weather with snow storms and damaging ice buildups it is likely that there will be occasional primary power interruptions requiring backup power for periods ranging from a few minutes to several days. Another consideration is that we live in the post 9-11 world where power grid damage from human sources is a real possibility. Under those conditions backup power in public facilities may be required for extended periods. Under those conditions failure of equipment is unthinkable. Relatively simple and inexpensive maintenance can raise the reliability and longevity of this equipment significantly.